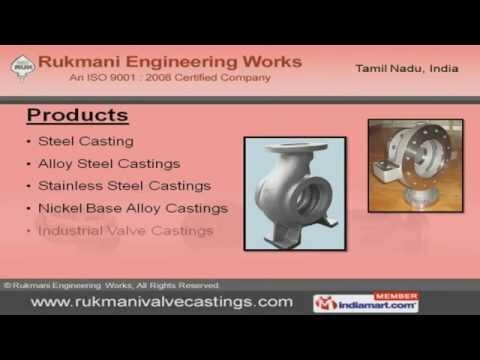 Rukmani Engineering Works Welcome to Rukmani Engineering Works, leading manufacturer and exporter of Steel Castings. Established in 1996, we are an ISO 9001:2008 certified company, providng after-sales service & support, trained professionals and are managed by Mr. T. Radhakrishnan. We offer innovative range of products with ultramodern facility, and believe on transparent dealings, we maintain quality standard, easy modes of payment and wide distribution network. We are offering a range of products like Steel, Alloy Steel, Stainless Steel, Nickel Base Alloy, Industrial Valve & Pump Castings. 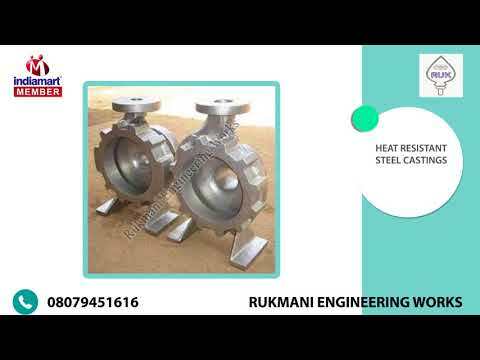 Our Stainless Steel Castings products are Heat Resistant & Duplex Stainless. Our ranges of Nickel Base Alloy Castings are Hastelloy, Inconel and Monel. Industrial Valve Castings offered by us Butterfly, Globe, Ball and Gate. Industrial Pump Castings categorized as Centrifugal, Plunger, Bearing Housing, Sleeves, Impellers and Hastelloy. Lastly, the range extends to Engineering Castings covers Drilling Hammers, Agitator Blades & Castings and Turbo Charger Housing.